Judge Won't Drop 'Aiding The Enemy' Charge Against Manning : The Two-Way That is the most serious charge against Pfc. Bradley Manning. It is punishable by life in prison. Army Pfc. 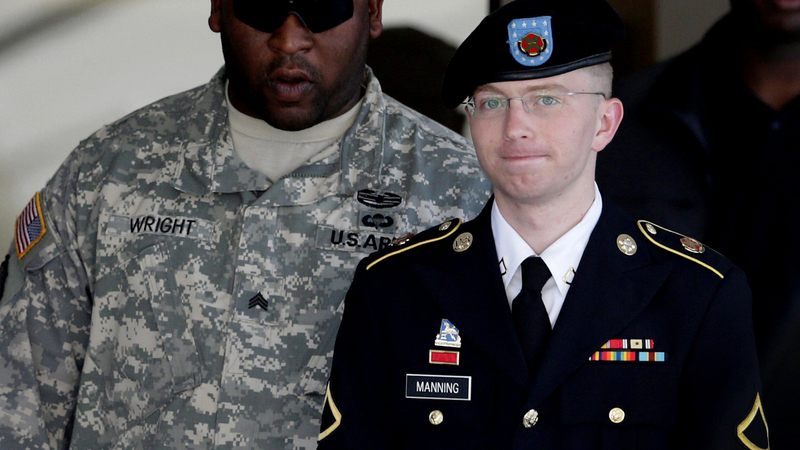 Bradley Manning (right) is escorted out of a courthouse in Fort Meade, Md., on June 25, 2012. His attorney announced that Manning, who is accused of leaking classified information to WikiLeaks, had agreed to plead guilty to lesser charges. The military judge presiding over the court-martial of leaker Bradley Manning has declined to drop the most serious charge against him. The Associated Press reports that the judge, Col. Denise Lind, said she would allow the government to proceed with a case accusing Manning of aiding the enemy, a charge punishable by life in prison. Lind found the government had enough evidence to support the charges, the AP says. Manning, who has admitted to perpetrating the largest leak of classified data in U.S. history, has pleaded guilty to lesser charges but has always the denied aiding the enemy. As we've explained, to prove the "aiding the enemy" charge, the government has to prove Manning leaked the information with the intent to help an enemy. "The decision of the judge, Col. Denise Lind, centered on the prosecution's evidence that some of the classified documents Private Manning admitted giving to WikiLeaks were posted on the Internet and later reached Osama bin Laden. "The judge heard a request from the defense on Monday to drop the charge. David E. Coombs, the lead defense lawyer, argued that Private Manning did not have 'actual knowledge' that by leaking the documents to WikiLeaks he was aiding the enemy. "In the past, the government had argued that through his extensive training, Private Manning should have known that the information could end up with groups that wanted to harm American military personnel. But the government acknowledged Monday that 'should have known' was not enough to define 'actual knowledge.' "
Civil libertarians and some law scholars are weighing in, now, saying this decision may have far-reaching implications. "You don't need specialized intelligence training to know that terrorists use the internet. By this logic, any military officer who discloses information to the media or posts it on the internet could be charged with aiding the enemy. That's not consistent with the purpose of the law, and it could have a dramatic chilling effect on would-be whistleblowers." Boston College Law School professor Mary-Rose Papandrea, the author of an upcoming Law Review article about the First Amendment and leaks, said this decision exacerbates the "the government's inability to distinguish between traitors and leakers." "There are very important differences between those who send information to the enemy with the intent of aiding the enemy and those people who release information to the public with the intent of informing the public debate," Papandrea said. "It's time for our legal system to draw some clear distinctions between these two categories."